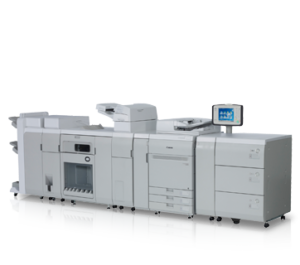 Canon production printing devices are perfectly suited for central reproduction departments, print-for-pay establishments, print-on-demand applications and large corporate offices, where rapid document capture and high volume production are required. With effortless speed and ultimate versatility High durability parts and components have been built into the production printing systems to give you superior reliability and production capabilities. With a long-lasting and durable drum and a new high capacity toner system, it deliver’s low operating costs, easy maintenance and minimum downtime. High-resolution prints receive a sharper edge with Canon’s exclusive technology which enables accurate detailing and outstanding image quality on every page. Black and white duplex cutsheet and sheet fed production printers and copiers. Provides high speed and high quality printing for commercial printers and corporate environments. you won’t find a more complete solution anywhere else.